Sixt is your perfect partner for car rental in Portugal. 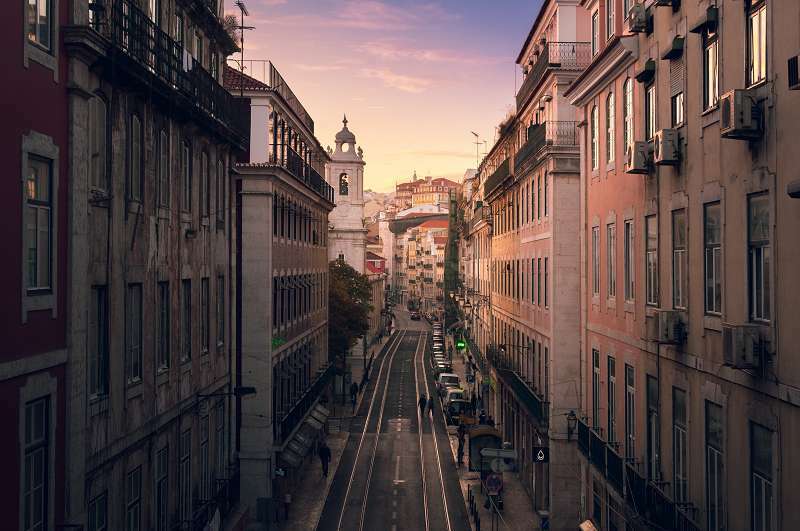 Our extensive branch network includes top vacation destinations along with major cities like Lisbon and Porto. You will also find us at Portugal's most important airports. Our convenient locations mean that we can fit with your travel plans and you will soon be on your way and enjoying Portugal from the comfort of your quality rental car. Portugal has fabulous beaches, fascinating cities and some beautiful natural areas, and all are easily reached with your car rental in Portugal. Your trip will be open to many possibilities when you rent a car in Portugal with Sixt and you can enjoy the drive knowing you are behind the wheel of a well-maintained, top quality vehicle from our up-to-date fleet. Visit this intriguing country in winter to avoid the crowds and the heat. During this time of year you can get some much needed sun along the Atlantic coastline. In the southern part of the country, like the Algarve region, the temperatures can be in the 60s in the winter although in the north, in Porto for instance, it is much colder. Lisbon has activities and museums year round, although the weather can be unpredictable. You can visit the Jerónimos Monastery or the famed Alfama district. Serra da Estrela is the highest mountain range in Portugal and you can find ski slopes here. Your choice of rental vehicle depends on where you are going. A tour of the interior of Portugal will be fine in a sedan, but if you are planning a longer trip, an SUV will be more comfortable. You are sure to find the ideal rental vehicle in our premium fleet. Once you have found the model to suit your mobility needs book one of our great car rental deals in Portugal easily online. While making your online reservation you can select from our range of extras to further customize your rental vehicle to your requirements. Navigation systems and the E-Toll Service can make it easier to get around, while child seats are available so you can travel lighter and leave yours at home. We also offer extra protections and additional driver coverage. Our compact city cars are perfect for narrow, winding streets and are easy to park. A luxury sedan provides top comforts and amenities to make solo or family road trips more enjoyable. SUVs are the perfect choice for those with outdoor gear or wanting a more robust, all-weather vehicle. Larger groups are catered for with our minivans and some branches even offer 12 to 15-seater passenger vans. When you arrive to pick up your vehicle, the renter and driver must present an identity card or passport along with a valid driver's license. US visitors can use their regular license so long as you don't have an EU visa in your passport. If you do have an EU visa, your license is still valid if you have been in the EU for less than six months. An International Driver's Permit(IDP) is required if your license is printed in a non-Latin alphabet, such as Chinese, Arabic or Russian. To rent a car in Portugal from Sixt you must be at least 19 and have held your license for a minimum of one year. Additional age restrictions may apply to certain models. These will be highlighted by the booking engine in the rental process. Sixt accepts all of the major credit cards but we cannot accept debit or prepaid cards and cash payments are not permitted. If you experience an accident or emergency, call 112 to contact the emergency services. Any accident must be reported to the police, even if no other vehicle is involved. Any damage must be reported to Sixt immediately and the accident report form filled out. Our car rental deals in Portugal allow cross border rentals on request to a number of European countries including neighboring Spain. You must inform the rental branch of your intentions or all coverages will be invalidated. Further information is available on our page detailing all important rental information. Portugal has an extensive road network and the major highways tend to be modern and in good condition. Many of these routes require tolls, so have plenty of change ready or choose our E-Toll Service option when you choose car rental in Portugal with Sixt. The E1 is the main north-south route on the west coast, connecting Faro with Lisbon and Porto. The E802 serves the east of the country and the A22 runs east to west along the Algarve coastline. In general, speed limits are 50 km/h in urban roads, 90 km/h on non-urban roads and up to 120 km/h on motorways. You must drive on the right and overtake on the left. All drivers and passengers must wear seatbelts at all times. Not far from Lisbon is the town of Sintra known for its architectural monuments. You can visit many historical buildings including the three top castles: Pena Palace, Quinta da Regaleira and Monseratte Palace. Located on a hilltop and encircled by a fortification wall is the Óbidos Historic Center. Its streets, squares and castle are all well-preserved examples of medieval architecture. The Alfama District leads up from theTejo river to the Sao Jorge Castle and is Lisbon's oldest district home to a labyrinth of narrow streets. Porto is one of the oldest European centers and its historical core is a UNESCO listed World Heritage Site. It has quite an architectural legacy, due in part to its expansive history, and home to the Porto School of Architecture, one of the world's most prestigious. Of course it is also well-known for producing Port wine which is made along the Douro River that runs through the city. The Algarve beaches at the southern tip of Portugal are known for being some of the best in the world. As the area stretches for quite a ways its coastline is a variable mix of sandy beaches to more rocky, rugged shores. Located in the Central Group of the Azores, Pico Island is famous for its volcano, Ponta do Pico, which is also the highest mountain in Portugal. Sitting in the crater of a dormant volcano are the two lakes that comprise the Lagoon of the Seven Cities. Located on the island of Sao Miguel in the archipelago of the Azores, the twin lakes are connected by a natural channel and are the largest bodies of water on the islands. Funchal is the capital city of the Madeira archipelago and is home to many special gardens like the Jardim Tropical Monte Palace and the Madeira Botanical Garden that hosts thousands of exotic plants. There are also several nature reserves in the area.